I was first introduced to the stock market in fifth grade. My teacher, Mr. Hill, divided our class into five teams, and we were given a certain amount of Monopoly money to buy and sell stocks. The team that made the most money after a month or two won something. I don’t remember what it was, but I think it involved pizza and soda and cake. What I do remember is that I took this game very seriously, and so I researched stocks into the wee hours of the morning and threw aside all of my other fifth grade obligations, like baseball and homework and Spongebob Squarepants. My team ended up winning by, like, eighty million dollars. I have always liked the stock market. I also enjoy reading the perspective of some intelligent and thoughtful writers. Eddy Elfenbein is one of those guys. Eddy writes an excellent blog, Crossing Wall Street, where he tries to help individual investors navigate the confusing, sometimes scary world of the stock market. His theory of investing is very simple: buy and hold shares of outstanding companies. He also creates a yearly Buy List of 20 companies and aims to beat the S&P 500. Once he chooses the companies, they are locked for the year. Eddy has beaten the market every year since 2007. CNN Money named him the best buy-and-hold blogger. He also likes baseball. I am thrilled that he agreed to be my fourth interview. Eddy, welcome to the blog. Every year you create a buy list with 20 of your favorite stocks, and you have a clear goal: to beat the market. And, you’ve had a remarkable run of doing so. What do you look for when you’re evaluating a stock? It’s very simple – I look for a very good company that I think is going for a decent price. I try not to get too linear or come up with particular equations. I have a watch list, which is like a minor leagues of companies that I consider well-run. Year-in and year-out, you know that they’re generally going to be profitable, they’re going to grow their business, they generally have lower debt and stronger margins. And I just wait for one of them to take a dip. It could be for severe reasons that can’t be fixed, or quite often, they are transient reasons that can be fixed. Then I’ll add it to the buy list. You can never guarantee that any single one will pay off, but if you have a broadly diversified list, then enough of them will pay off. I aim to beat the market by a few percentage points each year. What is your background? How did you become a guy who writes about the stock market on the internet? 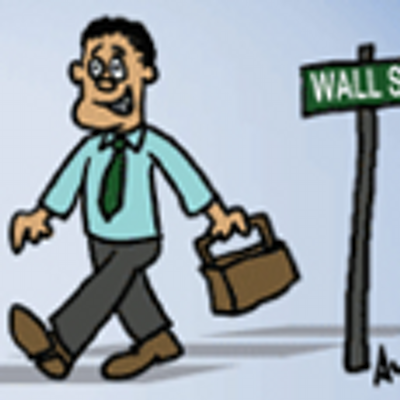 I started out as a broker in a sort of boiler room, Wolf of Wall Street-type existence. It wasn’t quite that shady. Then I hooked up with a more established firm and worked there for awhile. And then I started my own newsletter, which was read by maybe dozens. This was before the internet. I was able to get a job working for an official newsletter publisher and I did that for a number of years. There, I got a good education in writing about finance for a mass audience. Then, nine years ago this July, I started the blog. So, describe your day. I imagine you wake up a few hours before the market opens. Then what? Basically I wake up, go on the internet, and I check the regular sites like Bloomberg and the Wall Street Journal and Twitter. I’ll see if there is anything on CNBC. Usually I have a pretty good idea of earnings reports or economic reports. I look to see if there are any big developments on the buy list. And then I’ll do a couple posts each day. I can’t do anything more than the Wall Street Journal does, so I try to do commentary of the news. I’ll post something I find interesting, or a historical fact, or an overlooked fact about the market. I try to see something that can draw a broader lesson about investing. You seem to be a very rational, logical person. It’s difficult to find that with people that discuss the stock market. Like, sometimes I turn on CNBC and I just want to go crawl in a hole. Does the coverage of the stock market frustrate you? I don’t get too bothered by it. One of the things about investing is that you have to fight yourself, and keep your emotions away. Mr. Spock would have been a great investor. You just have to approach the market logically and rationally, because so many people don’t. I know this from being a broker, but when people are down and disappointed, they get angry and they sell and they act in all sorts of weird ways. So I try to be as business-like and dispassionate as possible. I am 23 years old. How should I approach the stock market? I don’t think that’s a good place to go yet. I think you want to save your money in the bank. I don’t think people in their early 20’s should worry about the market. Once you’re at about, say, $10,000, then I would recommend going into ETF’s. But I don’t think you should be a stock picker until you’re at about $50,000 in net worth. And, I would also say, get the school loans out of the way. Because when you’re in debt, you need to be more concerned about investing in yourself than investing in other companies. I was a finance major in college. So, I learned a lot about corporate finance – discounted cash flows and the weighted average cost of capital and the Black-Scholes model. But, personal finance was never really taught, and I think a lot of recent graduates don’t know much about investing or the stock market or how to make a budget. Do you think high schools and colleges should spend time teaching this? Or is it something everyone has to learn on their own? Unfortunately, colleges don’t teach it well enough because people would realize what a scam many of them are! I would say, the worst thing for young people are credit cards. Now, obviously there are many people who can handle a credit card, but it is very difficult if you run up enormous amounts of debt. You’ve heard the story of people ordering the “$200 pizza.” It wasn’t $200 when they ordered it, but they let it ride on their credit card debt, and that’s how much they in fact paid for it in the end. Credit cards are such a huge problem for so many people. It’s surprisingly dangerous. A lot of the bankruptcy seminars that get people to manage their finances say: spend paper money. Because people spend less once they actually cross that psychological barrier. You feel the money that you’re paying for your burrito. That’s how the mind works. The number of Americans that own a stock is lower than it’s been in quite some time. In the wake of the financial crisis, are people still afraid of the stock market? Should they be? Well, it depends how they use it. I think a lot of people are afraid of the stock market, but it’s one of those things that’s like, there’s fire or the force. There’s a good side and a bad side. If people use it to day trade, or think they’re going to make a quick buck, then they’re not going to do well. Warren Buffet’s famous view of the stock market is that it’s a machine that transfers money from the impatient to the patient. So if you have long-term planning and you’re not rattled by downturns, then I think the market is a great place to be. The stock market is the best investment – better than commodities and bonds and even real estate. Alright, let’s talk some baseball. Royals and Orioles in the ALCS. Your Nationals are down 2-1 to the Giants. It looks like a toss-up between the Cardinals and Dodgers. Thoughts on the playoffs so far? The thing about baseball is that the regular season is 162 games. It is probably the most meritocratic game. The sample size is just so big, so the noise gets filtered out. And then you come to the playoffs, where noise is a very prominent factor. So you have the Nationals and the Giants play two games where one was effectively a tie and the other was almost effectively a tie, but it fell against my team both times. The A’s collapse was just horrific. They had like the best record in the A.L. on August 7th, and then after that they had the worst record. But their pythagorean differential was like 11 wins. I don’t ever remember seeing that. It always seems like it’s within plus or minus three. In one run games, they were 21-28, but in blowouts they were 30-13. So they were winning the blowouts but losing the close one’s. There is a lot about baseball statistics that is similar to the stock market. It’s about looking at the numbers with a rational approach and understanding what areas you can’t do anything about. I do think there is a connection between baseball and investing, even though it is a completely different universe. It sharpens the mind when you think about issues with baseball and baseball statistics. There used to be something called a newspaper. They would bring it to your home. Believe me when I say this. I grew up reading the Washington Post, and on the back of the sports page was always the business page. I think that’s how I first got interested in finance. Because there is certainly a similarity between the two. Price of S&P 500 at year end: I have absolutely no clue. Strangest email you’ve received from a reader: Overwhelmingly, people are very, very nice. But I had one guy send me a spreadsheet of 200 stocks, and he asked me my opinion on each one. Yeah, ok, let me take the next three weeks off and I’ll get back to you. And, finally, I plan to retire in 2055. What can I expect over the next 41 years?